As of last week, Nitzer Ebb’s recently released Industrial Complex was #101 on the CMJ Top 200 (College Music Journal). The album also debuted on several college radio stations around the United States with very high ratings. Industrial Complex has a strong hold of the #1 spot at WRST in Wisconsin (Wisconsin’s Radio Station of the Titans)! WUVT interviews Nitzer Ebb frontman Douglas McCarthy about the band’s history and their first release in 15 years, Industrial Complex. Note: the american release date of IC was on november 09, 2010. 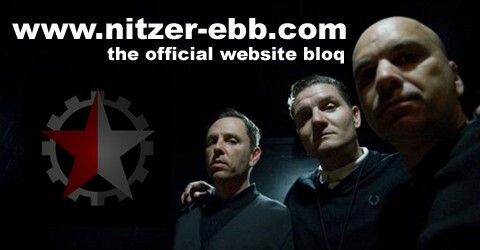 Industrial Complex is Nitzer Ebb’s 6th studio album to date, once again produced by Flood (Editors, Depeche Mode) and featuring guest vocals by Depeche Mode’s songwriter Martin L. Gore on the song Once You Say. The sound is back to the roots, read: oldschool EBM. Includes 5 Bonus Tracks, including a new track, On The Road, not found on any other CD release of this album. The band was joining DJ Paul V. in the studio for Neon Noise Radio show on november 04th, 2010. They spoke about their career, their influence on modern EBM, and the new disc called Industrial Complex as well as their upcoming america tour. On The Road, a unreleased track from IC Session, was broadcasted for the very first time. Beside Ebb classics like Warsaw Ghetto, Murderous and Control I’m Here, some new tracks from Industrial Complex Album were played too.